May soybeans closed 12 1/2 cents lower at USD9.48/bushel; July soymeal ended USD4.60 lower at USD276.80; July soyoil settled 54 points lower at 37.51. NOPA reported a below average crush number of 131.7 million bushels for April. A weak crude oil market and firm dollar was also bearish. More wet weather will occur in the Midwest over the next 5 days, that may encourage some switching of corn acres into soybeans. July corn closed at USD3.63 down 10 cents; December corn ended 9 cents lower at USD3.80. Private exporters announced the sale of 100,000 MT of US corn to Japan, who are apparently shopping for 2.7 MMT of corn for delivery this summer, according to media reports. Weak crude oil and ethanol prices are bearish for corn, as is the strong US dollar. Underlying Chinese interest looks like preventing prices from falling too much however. CBOT July wheat ended down 7 1/2 cents at USD4.71 1/2; KCBT July wheat fell 5 3/4 cents to USD4.91. MGE July wheat declined 5 1/2 cents to USD5.12 3/4. Drier and warmer weather in the northern Plains should allow spring plantings to pick up. Kansas is getting much needed rain for their wheat crop. Condition ratings will be out Monday in the weekly crop progress report. Some significant hail damage was done this week to the top soft red wheat state of Ohio. May London wheat closed GBP1.55 higher at GBP104.00/tonne, although November was GBP0.65 lower at GBP105.10/tonne. November Paris wheat closed EUR0.25 firmer at EUR140.25/tonne. Both the pound and euro continue to remain under pressure, with the latter sinking to it's lowest levels since late 2008 against the dollar today. That will help to underpin prices here. Algeria reportedly bought 500,000 MT of French wheat for June/July, aided by the weakness of the single currency. With only seven weeks of the 2009/10 marketing year to go the EU has issued soft wheat export licenses for 15.4 MMT, compared to 18.8 MMT a year ago. Wheat imports however stand at 2.86 MMT versus 5.52 MMT in 2008/09. Many EU countries were closed yesterday for Ascension Day, which contributed to light trade also today. Crop conditions in northern and western Europe look OK, but generally nothing more than that, whereas things look mostly pretty good in the east and south of the region. It is worth noting that the places where things are only looking OK include France, Germany, Poland and the UK. 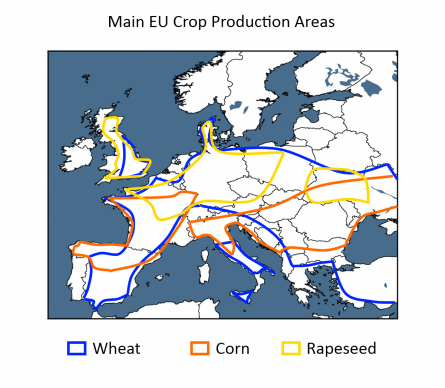 These account for Europe's top four rapeseed and wheat producing countries and three of the top four barley growers. A German Agribusiness Report for Q2 2010 says that "grain production in Germany now looks set for a poor year in 2010. Cold, wet weather over the winter will likely see yields of both wheat and barley fall." My Ukraine agronomy chum Mike Lee bemoans on his blog (here) that he's had his water turned off in Kiev for a fortnight now. Liverpool-supporting Mike (yes they even have them over there,) appears not to have realised that the Ukraine Water Board have probably singled him out for a playful bit of lesson teaching. Or possibly they thought that as Kopite scum hardly ever wash, they were just doing some research to see how long it would be before he noticed? Mike has managed to haul his smelly unwashed frame out into the Ukraine countryside and shoot a very interesting video of the state of play with the local wheat and OSR crops over there, which is well worth a watch. He even slipped out of his Stevie G replica top to don a proper shirt before he took it too. He's also thrown in a quick excerpt of what is No1 in Ukraine this week at the end of the video, keep up the good work Mike! They've just bought their largest consignment of US corn since 2001. Today the Chinese government say that they will limit the amount of corn that individual trading companies can buy, and also ban the resale to others of any corn sold at their weekly auctions. The reason is to prevent hoarding, they say. Well, if you've really got 50 million tonnes in state-owned stocks then why would anybody want to hoard corn? Why not auction off so much of it that the domestic price will fall back in line with world prices? That would teach the nasty hoarders a lesson wouldn't it? Why allow a situation to develop where domestic corn prices are double what they are in the US when you've had year after year of bumper corn harvests? Including a hefty 163 MMT of the stuff last year. The state silos must be groaning under the pressure of it all surely? Just let it all out and that will be the end of the problem. You did have a bumper crop didn't you? And all those stocks really are still there aren't they? For the week of 7-13th May there were unsurprisingly no offers put up to place barley into intervention at the princely sum of GBP90.97/tonne, minus adjustments, according to the RPA. A total of 175,859 MT has so far been put up for offer, with cumulative net barley offers standing at 153,052 MT after rejections/withdrawals. "Grain production in Germany now looks set for a poor year in 2010. Cold, wet weather over the winter will likely see yields of both wheat and barley fall. Low prices in 2009 also contributed to a fall in area. Barley production will be the worst hit. Bumper crops in 2007/08 and 2008/09 have seen stocks rise. Demand for German barley on the export market is weak owing to bumper crops in other major producers. This will see intervention purchases rise owing to the low market price." Unfortunately if you want a little more flesh on the bones than that then you have to part with GBP330: Achtung! May Soybeans closed Thursday's trading session at USD9.60 ½, up 1 cent; May Soybean Meal at USD284.40, up USD3.10; May Soybean Oil at 37.80, down 36 points. A firm dollar and weak crude oil kept prices on the defensive, with soon to expire May the only soybean month to close in positive territory. Weekly export sales were 474,616 MT - towards the low end of trade guesses, although China bought both old and new crop. May Corn closed at USD3.66 ½, down 5 ¼ cents; December Corn ended at USD3.89, down 3 ½ cents. The USDA reported weekly export sales of 819,100 MT for 09/10 and 120,900 MT for 10/11. none of those were confirmed as being for China. Hot on the heels of that announcement however came the news that China had indeed bought 369,000 MT of US corn under the daily reporting system (where sales in excess of 100,000 MT must be reported immediately). There was also an additional 174,000 MT sold to unknown destinations. July CBOT Wheat closed at USD4.79, down 12 ½ cents; July KCBT Wheat at USD4.96 ¾, down 10 ¼ cents; July MGEX Wheat ended at USD5.18 ¼, down 11 ¾ cents. Wheat export sales were 244,400 MT for 09/10 and 241,100 MT for 10/11, a little better than expectations of 300,000 to 400,000 MT. Japan also bought 142,000 MT in it's usual Thursday tender, of which 80,000 MT will come from the US. Strategie Grains cut their EU-27 soft wheat production estimate by 1.2 MMT, with lower output now seen in the north and west of Europe, and higher production in the east and south. EU wheat closed mixed Thursday with Paris November milling wheat down EUR1.25 at EUR140/tonne and London November feed wheat up GBP0.25 at GBP105.75/tonne. It was a quiet session with many places around Europe off on holiday for Ascension Day, which will likely mean a subdued Friday session too. UK wheat was supported by the ailing pound, which fell to around 1.47 against the dollar, as the UK trade deficit widened and the enormity of the task facing the new coalition government became even more apparent. Strategie Grains cut their estimate for EU soft wheat production by 1.2 MMT to 133 MMT. EU-27 All wheat output they see at 141.4 MMT, 3.7 MMT less than the USDA predicted on Tuesday. German soft wheat production was cut 800,000 MT and French soft wheat output was reduced by 500,000 MT. Scandinavia, Poland and the Baltic countries also had their estimates cut, although this was offset by increases in production in eastern Europe. The recent spell of cold and dry weather is finally forecast to come to an end as winds shift to westerlies. As well as warming things up low pressure will also bring some much needed rain. The overnight grains closed mixed with corn around 1-2c higher and wheat and beans 1-2c lower. The dollar is firmer and crude weaker, both of those are of course negative for the grains sector. Corn is doing it's best to mount a bullish storyline. Although the USDA's weekly export sales were a tad disappointing, and didn't include any confirmed sales to China. Hot on the heels of that however came the news that China had indeed bought 369,000 MT of US corn under the daily reporting system (where sales in excess of 100,000 MT must be reported immediately). There was also an additional 174,000 MT sold to unknown destinations. Japan bought 142,000 MT in it's usual Thursday tender, of which 80,000 MT will come from the US. Strategie Grains cut their EU-27 soft wheat production estimate by 1.2 MMT, with lower output now seen in the north and west of Europe, and higher production in the east and south. Weekly soybean export sales were a tad disappointing, heavy Midwest rains might switch a few unplanted corn acres into soybeans too. "The top US corn states Iowa, Illinois and Nebraska have received very heavy rain this week over 1.5 inches and in some areas over 2.5 inches. Rainfall has accumulated with recurring showers over the past 2-3 days. Heavy rains will be ending today in the wet corn states. But strong thunderstorms are moving across northern Illinois into Michigan and north Indiana," says Gail Martell of Martell Crop Projections. Early calls for this afternoon's CBOT session: Corn up 1-2c; Wheat down 1-2c; Beans down 1-3c. The USDA's weekly export sales failed to throw any light on the recently rumoured/reported Chinese corn buying spree. Sales for the period April 30-May 6 for corn were 819,100 MT for 09/10 and 120,900 MT for 10/11, below expectations of 1-1.3 MMT. There were no confirmed sales to China, or any sign of 'unknown' amongst the old crop sales, although 'unknown' did take almost all the new crop. Wheat sales were 244,400 MT for 09/10 and 241,100 MT for 10/11, a little better than expectations of 300,000 to 400,000 MT. Soybean sales were 263,300 MT for 09/10 and 211,300 MT for 10/11. China was in evidence for both marketing years. Actual shipments were 1,033,200 MT for corn, only 195,300 MT for soybeans and 518,100 MT for wheat. Abengoa's flagship Rotterdam bioethanol refinery is set to start production this week, according to media reports. The plant is slightly larger in size than Ensus and will churn out 480 million litres of bioethanol, if and when it gets up to running at full capacity. Abengoa themselves are saying that they expect to be running full tilt as early as June. Although the company list the feedstock as "grain" I gather that this means "wheat normally". Hurrah, that's another 1 MMT+ of surplus wheat taken care of. The plant will also kick out 360,000 MT of DDGS, according to the official company website. That's a lot more DDGS on the European market, maybe we aren't going to miss Bunge Mannheim as much as we thought come the autumn? I wonder if they've put in a pelleting press to allow the by-product to more easily "travel"? Answers on a postcard please to the usual address. Not judging by the frost on the cars in my part of North Yorkshire this morning it isn't. No, I'm not peeping out from under the duvet (never go under my duvet, that's a golden rule). 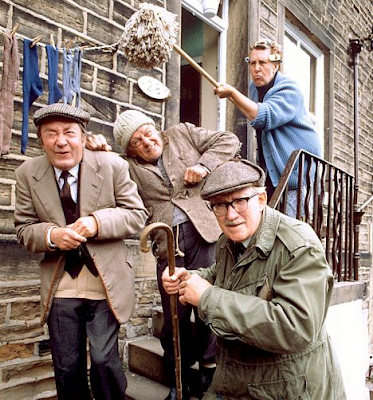 I've already been out for my morning constitutional with Nogger's Dog, Chummy and very pleasant it was too, if somewhat "parky". Local temperatures got down to -1.4C apparently, although this might be the last of this run of "pretty unusual cold nights" according to Metcheck.com. They are giving lows for the weekend here of 2/3C, with daily highs of 16C. 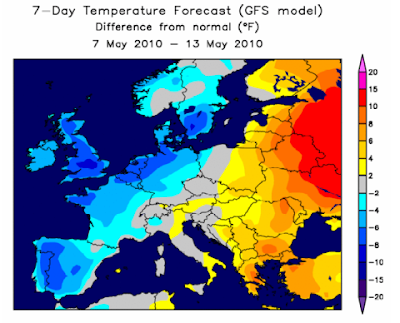 By next Weds they are forecasting lows of 9C and highs of 22C, so let's hope that things are going to start to look and feel a bit more summery from now on. The main reason that they see things warming up a bit is that we "finally lose that north or northeasterly wind which has persisted for so long. Instead the winds will begin to come in from more of a westerly quarter as low pressure develops to the north of the country." That comes, as ever with the English weather, a caveat or two; "This means that it won't be particularly settled with rain or showers likely, particularly towards the northwest," they say. Right now everything looks and feels a bit retarded, like an X Factor semi-finalist. I have a gut feeling that yields are going to disappoint this year, and it seems that I am not alone. Our garlic-munching, strike-loving scaredy cats the French seem to agree with me. Strategie Grains have today cut their estimate for EU-27 soft wheat production by 1.2 MMT to 133 MMT, citing the generally dry and cold weather conditions we've seen so far this year in the UK, France, Germany and Scandinavia. With durum wheat production coming in at 8.4 MMT, that gives us an all wheat crop of 141.4 MMT this year. That's 3.7 MMT less than the hapless USDA's estimate released on Tuesday. It's still an increase on 2009's all wheat output of 3.5 MMT, or 2.5%, mind, so don't go getting carried away with ideas that there's going to be a shortage just yet. "Once the harvest clearance period of probable downward pressure has passed, the potential for EU prices movements will be upward," they helpfully advise. May Soybeans finished the day at USD9.59 ½, up 1 ¼ cents; May Soybean Meal ended at USD281.30, down USD1.00; May Soybean Oil was at 38.16, up 13 points. The USDA's weekly export sales numbers will be out tomorrow with trade estimates between 500,000 and 800,000 MT. The US soybean crop is off to a good start with plantings at 30% complete as of Sunday, compared to 15% last year and 19% for the 5-year average. A return to cooler and wetter conditions will hamper that progress this week. May Corn closed at USD3.71 ¾, up 2 cents; Dec Corn was at USD3.92 ½, down ½ cent. Possible further US corn sales to China appeared to be confirmed when Chinese government-owned agency Cofco said it had bought six cargoes of US corn from Bunge overnight. Trade reports suggest that maybe up to 15 cargoes have been bought since the turn of the month. That makes tomorrow's USDA weekly export sales report quite interesting. Export estimates for that report range between 1,000,000 and 1,300,000 MT. July CBOT Wheat closed at USD4.91 ½, down 1 ¾ cents; July KCBT Wheat was at USD5.07, down 2 ½ cents; July MGEX Wheat at USD5.30, down 3 ¼ cents. Wheat futures were sharply higher earlier in the session but closed towards the lower end of the days trading range. Trade estimates for tomorrow's weekly export sales report range from 300,000 to 400,000 MT. US winter wheat is not looking in great shape, despite positive crop condition ratings from the USDA. Yield potential in the top-producing state of Kansas was downgraded last week, and spring wheat planting in northern US states like ND is running late. Nov London wheat ends GBP0.50 higher at GBP105.50/tonne, with Paris Nov wheat up EUR1 at EUR141.25/tonne. Prices flirted either side of unchanged for most of the day, but were supported later by Chicago wheat coming in significantly higher on short-covering. Currencies had another volatile day, with the pound breaching 1.50 early in the day before ending up around 1.4850 after bearish comments from BoE governor Mervyn King saying UK growth risks have 'increased somewhat'. This two steps forward one step back mentality seems likely to be a recurring theme between now and harvest. The political uncertainty in the UK looks likely to only undermine the whole thing even further. Nick Clegg and David Cameron suddenly seem to be acting like a couple of love-struck teenagers, but it can't last that long before one of them comes home from No 10 to find his pet rabbit on the hob surely, can it? The Ukraine Ag Ministry say that 35.6% of winter rapeseed crop perished due to harsh winter, and that 20% of winter crops need to be resown. 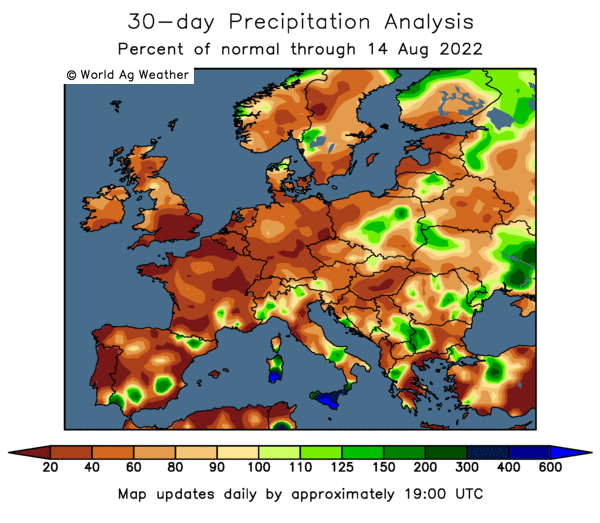 Whilst there doesn't seem to be a major worry over other EU crop damage caused by the hard winter that we've all had, there is maybe at least an unease over slow crop development in many parts of Europe. The overnights closed firmer with beans up around 4c, corn around 5-7c higher and wheat up 4-6c. Strong rumours that China has again bought US corn this week look set to underpin the grains complex this afternoon. The Chinese government-owned agency Cofco said it had bought six cargoes of US corn from Bunge overnight, according to media reports. Other reports are talking of further shipments having been negotiated separately in addition to these and the 115,000 MT confirmed by the USDA last week. There has been much talk recently as to the legitimacy of these sales, given China's distaste for all things GM (they don't mind a bit of melamine in their baby milk mind, but the thought of GM corn is abhorrent to them, apparently). Well, if it's a government agency doing the buying then that kind of suggests to me that the GM issue isn't going to be all that significant. As we found out a few years ago with Indian wheat, the strict import regulations have a habit of magically disappearing when your need is pressing. Which also suggests to me that maybe China's corn stocks maybe aren't really as plentiful as the official numbers make out. Reports abound that last year's corn crop was hugely overstated by the Chinese government. Bloomberg say that a survey commissioned by them, conducted by Geneva-based SGS SA, pegged Chinese corn production at 144.4 MMT in 2009. That's more than 10 MMT below what the USDA are still saying to this day, and almost 20 MMT beneath the official Chinese figures. May corn closed at 1,960 yuan on the Chinese Dalian exchange overnight, that's equivalent to around USD279/tonne, far dearer than US corn even after paying freight and discharge costs. Cash prices in Shandong province are over 2,000 yuan according to the China National Grain and Oils Information Centre (CNGOIC). Importing corn clearly stacks up, particularly into the drought hit south west of the country. How much will they buy? Clearly we could be talking potentially much more than the 300,000 MT that the USDA had them down to import in 2009/10 in their WASDE report released only yesterday. The USDA's numbers turn out once again to be a load of old rubbish even before the ink is dry, what a surprise. Meanwhile cool and wet conditions far away in the north of the country, where most of the nation's corn crop is grown (and where the bulk of old crop reserves are located), have got corn plantings off to a slow start for the coming season. The Chinese appetite for soybeans also continues unabated, with the country likely to import a record 5.8-6.0 MMT in June, according to CNGOIC. The trade will also be keeping an eye on developments in Argentina, where dock workers at the port of Ramallo are said to be disrupting operations in now familiar dispute over pay and working conditions. There isn't a lot to get enthused about as far as wheat is concerned, except spillover strength from corn, but that will probably get dragged along for the ride this afternoon. Early calls: corn called 6 to 8 higher; soybeans called 3 to 5 higher; wheat called 3 to 5 higher. ...this report on Reuters here suggests that the superstitious Chinese shy away from buying a green John Deere as the colour is considered unlucky. A man wearing a green hat could be doing so to signify that his missus has been up to no good, apparently. Did I ever show you that picture of me on my wedding day to Mrs N#1? Farmers in Uttar Pradesh aren't dansaking in the streets at the penalties being imposed by the Food Corporation of India for shrivelled grains on this season's wheat harvest. You will recall that the government dismissed the effect of a scorching end to the growing season as causing only "minimal" damage. Strange then that there is so much shrivelled wheat about that nationally government-backed agencies have managed to procure only 21.2 MMT of wheat from local farmers so far this harvest, compared with 27.7 MMT during same period last year. The government meanwhile still steadfastly insist that the 2010 harvest will beat last season's record production. On David Cameron's first day at the helm sterling has popped back up above 1.50 against the dollar and currently resides at over 1.18 against the euro. Cameron and Clegg looked quite comfortable with their new bed partners on the news last night, the question now is what happens when the honeymoon is over? Will they be heading to the divorce courts faster than Elizabeth Taylor on speed? It will be an interesting soap opera to watch that's for sure. In amongst the plethora of numbers released by the USDA yesterday were their first official estimates of 2010/11 crop production. Some items of note include EU-27 barley output at 59.4 MMT, only 3.4% down on last season's 61.5 MMT. Barley yields are seen higher in 2010 than they were in 2009, averaging 4.5 MT/ha, they reckon. That trims ending stocks by just over a million tonnes to 13.9 MMT. EU-27 wheat production for the coming season is seen at 145.1 MMT, 4.5% up on last year, with yields here also increasing slightly to 5.6 MT/ha. Ending stocks will grow further from 17.7 MMT at the end of 2009/10 to 18.2 MMT, they say. Although global wheat production will fall by almost 8 MMT, and consumption will increase nest season, 2010/11 ending stocks are still seen rising the best part of 5 MMT by the end of the marketing year with stocks to usage staying around the plentiful 30% mark. Kazakhstan are seen coming from nowhere a couple of years ago, to weigh in with wheat ending stocks of their own on a par with the likes of Canada and Australia. More like numb-ers than numbers if you are cryptically minded, considering that the combines will be rolling again before too long. China bought six cargoes of old crop US corn from Bunge last night, according to a report on Reuters. The overnight markets are a little firmer, but don't really seem to have reacted too much as yet. That's strange as everybody got all excited over only two cargoes last week, and the announcement comes on the back of yesterday's significant tightening of US 2009/10 ending stocks. The Chinese government's weekly corn auctions have been well subscribed too recently, and domestic prices there are almost double what they are in the US. Chinese corn consumption this season is expected to be 155 MMT, according to the USDA. That is probably significantly more than they actually produced in 2009 (although not according to the Chinese government it isn't). The USDA have them down as having coincidentally also produced 155 MMT last year. Yes, I know that they are supposed to have 53 MMT of ending stocks this season, according to our Spectrum ZX wielding chums in Washington. The USDA also have them down to import 300,000 MT of corn in the whole of 2009/10, but they would now appear to have bought more than that last night alone. Confucious he says: your stores are never empty, until the last kernel of corn is gone. He might have said that anyway. There's a bloke works down our chip shop swears he's Confucious. No not the one that was bombed by the Germans, the other one - the King Poo Gung Ho Fat Chap Pizza And Kebab Emporium, between Bet Frank and Sweaty Betty's Sauna & Spa. May Soybeans closed at USD9.58 ¼, up 5 ½ cents; May Soybean Meal at USD282.30, up USD4.10; May Soybean Oil at 38.03, down 7 points. the USDA left soybean ending stocks for 2009/10 the same as the April report at 190 million bushels, 10 million above the average trade guess. Ending stocks for 2010/11 are projected to climb substantially to 365 million bushels. Nearby demand remains strong with China seen importing record volumes of soybeans in May and June. May Corn closed at USD3.69 ¾, up 6 ¾ cents; Dec Corn was at USD3.93, up 6 ½ cents. Ending stocks for both 2009/10 and 2010/11 crop years below analyst's estimates. Corn ending stocks for 2009/10 came in at 1.738 billion bushels, well below the 1.861 billion that the trade was expecting, and down sharply from last month's estimate of 1.899 billion. Ending stocks for 2010/11 were pegged at 1.818 billion, also lower than the 1.901 billion anticipated. July CBOT Wheat finished at USD4.93 ¼, up ½ cent; July KCBT Wheat was at USD5.09 ½, up 1 ½ cents; July MGEX Wheat at USD5.33 ¼, up 5 ¼ cents. US wheat ending stocks for 2009/10 were seen at 950 million bushels, in line with estimates of 946 million, but stocks at the end of 2010/11 are seen rising further to 997 million, significantly higher than the 953 million expected. Private exporters announced a sale of 111,710 MT of wheat for delivery in the 2010/11 marketing year this afternoon to an unknown destination. May London wheat closed GBP1.25 lower at GBP102.25/tonne, and Aug Paris wheat down EUR0.50 at EUR134.25/tonne. It could have been worse, and it probably will be tomorrow. Gordon Brown went rather late in the day, buoying sterling at least for now, which will probably weigh on UK prices in the morning. The USDA also did their level best to help spoil the party by suggesting that the EU-27 wheat harvest will rise by 6.2 MMT to 145.1 MMT in 2010-11. Global inventories will rise to 198.1 MMT next season from 193.4 MMT in 2009-10, they also said. World 2010-11 wheat production was estimated at 672.2 MMT, far higher than estimates from the likes of the IGC (658 MMT), they added. The USDA numbers are probably too high, but they are in the market and prices will likely work lower this week on the back of them, regardless of their accuracy. 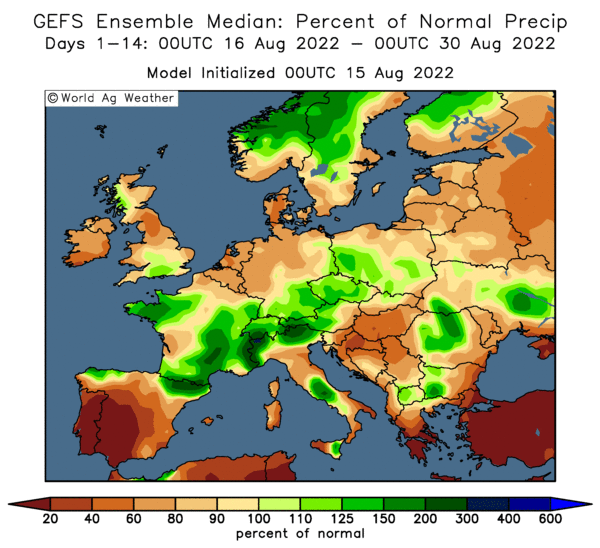 EU weather is less than ideal, with cold and dry in the forecast for major wheat producers like the UK, Spain, France and Germany this week. Ousted unelected former PM Gordon Brown has received a surprise call-up to the England squad for this summers World Cup in South Africa. Some pundits are suggesting that England coach Fabio Capello might have got the overweight 59 year old mixed up with Manchester United central defender Wes Brown, but Capello insists that this is not the case. "I er, how you say, intend to play him in a holding midfield role, because he is so bloody difficult to shake off," said Capello. 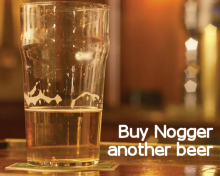 The England boss held secret talks with Brown over the weekend, I can exclusively reveal. "He assured me that he will lose a couple of stone by the start of the tournament next month, and that is good enough for me," added Capello. Brown, already nicknamed Cyclops by his team-mates, said that he was looking forward to a new challenge as he had become disillusioned by the lack of appreciation and respect he had been getting at club level recently. "Some nights I used to go to sleep crying my eye out. Mr Capello has asked me to do a job for the country, and I will do it to the best of my ability," he said. "I've been working with my advisers and I've come up with a few tactical suggestions which we will need to implement immediately if we are to have any hope of winning the World Cup," said Brown. "I'll start by naming my starting eleven for the opening game against America on June 12th," he added. Today's USDA reports are seen as bearish for soybeans and wheat, but supportive for corn. They forecast 2010 US corn plantings at 88.8 million acres, slightly lower than their March estimate of 88.94 million. Soybean plantings were forecast at 78.1 million acres, unchanged from March. Winter wheat production was forecast at 1.46 billion bushels, down only 4 percent from 2009. Corn ending stocks for 2009/10 came in at 1.738 billion bushels, well below the 1.861 billion that the trade was expecting, and down sharply from last month's estimate of 1.899 billion. Ending stocks for 2010/11 were pegged at 1.818 billion, also lower than the 1.901 billion anticipated. Soybean ending stocks for the current season were left unchanged at 190 million bushels, whereas a small reduction to 180 million was expected. Ending stocks for next season are seen rising significantly to 365 million bushels, higher than the 340 million anticipated. US wheat ending stocks for 2009/10 are seen at 950 million bushels, in line with estimates of 946 million, but stocks at the end of 2010/11 are seen rising further to 997 million, significantly more than the 953 million expected. Early calls for this afternoon's CBOT session: corn up 1-2c, beans down 7-10c, wheat down 5-7c. Who The Hell Is Flying The Plane? Nobody seems to know. The one-eyed Jock has fallen even lower in my already pretty low estimations. Apparently Pickfords are fully booked up until the autumn, so he might as well just hang on in their a while yet by the looks of things, whilst he handles negotiations with the Lib-Dems. As somebody wryly remarked on Twitter this morning, it's the unelected merging with the unelectable to attempt to form a government. Truly astounding. Popeye wasn't elected last time round, and he's now been unelected again, yet despite all that he seemingly hasn't fully got the message. It is of course no coincidence that he waited until just after 5pm last night to issue his latest missive, just minutes after the FTSE 100 had staged its biggest one-day rise since December 2008 and the pound had recovered to over 1.50 against the dollar. As soon as the horrifying news was out that a Lib-Lab pact might be on the cards the pound began to decline, a slide that has continued this morning down to the mid 1.47 region. The stock market isn't impressed either, with the FTSE 100 currently down 1.7%. In evidence this morning, with local temps falling to -1.5 according to my info. Beautiful clear blue skies now (as forecast) could see temps get quite a bit colder tonight (-5 potentially). Whilst it might not cause much in the way of damage, it certainly won't speed up already slow crop development. Cold and dry is the forecast for the next week to 10 days. Blimey, the kids will be breaking up for the summer holidays before we get some warmth at this rate. I blame Iceland. And Gordon Brown of course. May Soybeans closed at USD9.52 ¾, up 1 ½ cents; May Soybean Meal at USD278.20, up USD1.80; May Soybean Oil at 38.10, down 3 points. Traders were evening up positions ahead of tomorrow's USDA report. Informa Economics estimate 2010 soybean acres at 78.5 million compared to the USDA's March estimate of 78.1 million. Planting progress for soybeans as of Sunday night was at 30%, in line with trade expectations, and well ahead of 19% for the five year average. Emergence was at 7% compared to 4% for the five year average. May Corn closed at USD3.63, down 1 ¾ cents; December Corn futures were at USD3.86 ½, up ½ cent. Corn too was in consolidation mode ahead of tomorrow's USDA reports. Informa Economics pegged 2010 US corn acres at 89.6 million, higher than the USDA's March estimate of 88.941 million. Corn ending stocks for 2009/10 are expected to decrease to 1,865 million bushels from 1,899 previously. Corn planting progress was at 81% as of Sunday compared to the five year average of 62%. Emergence is at 39% versus 21% for the five year average. Wheat was sharply lower with July CBOT Wheat at USD4.92 ¾, down 17 ¾ cents; July KCBT Wheat ended at USD5.08 down 13 cents; July MGEX Wheat closed at USD5.28, down 13 ½ cents. Informa peg this season's winter wheat crop at 1.466 billion bushels, 57 million bushels lower than 2009's production, but 14 million above April's USDA estimate. Stats Canada today reported all wheat stocks there at 15,684 MMT at the end of March, down 3.5% from a year ago and towards the low end of trade guesses. Spring wheat planting is at 67% complete, winter wheat at 40% headed - three points behind the five year average. May London wheat ended GBP0.75 higher at GBP103.50/tonne, May Paris wheat closed down EUR3.25 at EUR130.75/tonne. Besides front month London wheat, all other contracts finished lower. 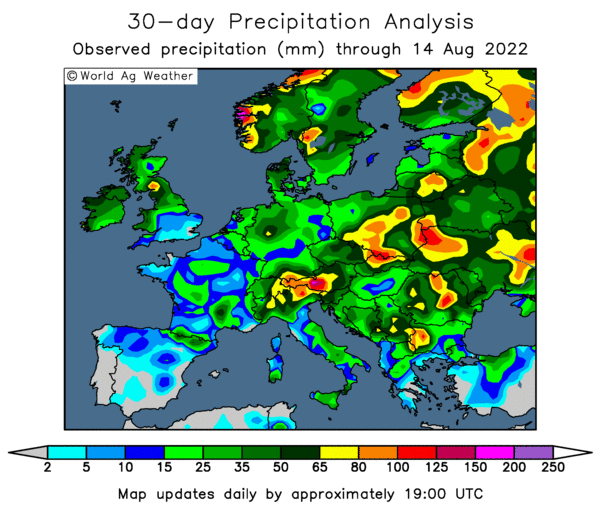 Rain in the past week or so across parts of the UK, France and Germany appear to have alleviated dryness concerns for now. Cold is more of a worry, with much lower than normal temperatures on the cards for the rest of the week across almost all of northern and western Europe. The USDA are out tomorrow with their first estimates of 2010/11 world wheat production. Their agricultural attaché last week forecast EU-27 wheat production for the coming season at 144.5 MMT (from 138.9 MMT in 2009/10), with barley output at 59 MMT (from 61.5 MMT). Paris wheat took a knock as the euro recovered somewhat from it's recent extreme weakness as EU finance ministers announced a EUR750 billion facility (on top of the EUR110 billion already allocated to Greece) to help indebted eurozone member countries. The pound had another volatile day, popping up above 1.50 against the dollar at one stage. It was however back under pressure late in the day on reports that all was not going well in coalition talks between the Lib-Dems and Conservatives. It will be interesting to see how the markets react tomorrow to breaking news that Gordon Brown is to quit as Labour leader to facilitate a surprise Labour/Lib-Dem alliance. Not Exactly Hot Is It? In fact it's freezing. Adas reported last week that crops in the UK are generally 7-10 days behind normal development, and they don't look like they are going to catch up over the coming fortnight that's for sure. Metcheck say "the outlook continues to be a cool one, and there is a notable risk of frost by night too over the next few nights which is of big concern for gardeners and growers." Although it's currently cloudy in the north of the country and we've had a bit of light rain overnight, these clouds and showers are forecast to fade away tonight, "with skies clearing a widespread frost is expected. This frost could be quite sharp in places too, and not just for tonight but over the coming nights as well," they warn. Temperatures here in North Yorkshire are forecast to dip to -2 tonight, with lows of -5 seen for the early hours of both Wednesday and Thursday morning. Night-time sub-zero lows are also on the cards for the weekend. Beyond that things don't look like getting a whole lot better either at this early stage, with 14C the warmest daytime temperature in the forecast for the following week. As well as remaining unseasonably cold it is also seen staying largely dry. I am. EU finance ministers have announced a "put it all on red" EUR750 billion facility (on top of the EUR110 billion already allocated to Greece) to help indebted eurozone member countries. It sounds like a lot doesn't it EUR750 billion? Although the Spanish probably need half of that on their own, and then there's still the rest of the PIIGS to muck out. All of which beggars the question: who is going to be there to bail us out? The one thing the Greeks and Spanish do have going for them is that they are members of a sixteen strong gang. Poor old GB is on it's lonesome, currently unable to even agree on who is in charge to think about how to tackle our huge budget deficit. The euro seems to be off the hook for now, but you can be sure that the sharks will be circling looking for their next easy victim, and I'd say that we seem to fit the bill rather nicely.